In the swamp are tall trees that make crooked, black outlines in the night. Amid the trees is Mr. Grimes, who looks the same. Dressed in dark and shabby clothes, old Mr. Grimes limps past pools of bubbling quick-mud and over rolling logs that span a creek before his home: the only patch of solid ground around. Grimes maintains a small farm, joined by his wife and son, Ambrose. The farm is supported by the labour of about a dozen other children, all treated like slaves. The boys and girls range in age from infancy to—thirteen? The eldest seems about that old. 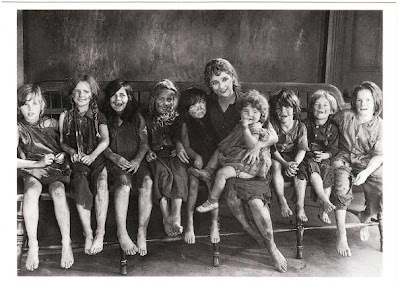 She is Molly, played by a then-34-year-old Mary Pickford. Grimes (Gustav von Seyffertitz) has no use for any of them, beyond the farm work they provide and the money their parents apparently mail him. Molly’s an unfailing Polly-Anna when it comes to the childrens’ futures—that is to say, she thinks they’ll all get out of Grimes’ farm alive. Day to day, though, she’s practical. She ensures the little boys and girls stay clean; defends them from the revolting Ambrose; negotiates with Grimes for more food for her charges and when that fails, she teaches the children how to steal his potatoes. Maybe her sunny side is itself a practical strategy—she’s older than the rest, and has seen more. She may have seen Grimes commit murder. In defence of her fellow children, Molly is a two-fisted young’un; hardworking and gutsy and smart, though without education to back it up. This makes her practically identical to half a dozen other heroines I’ve seen Pickford play in other films. But those films are not Sparrows. 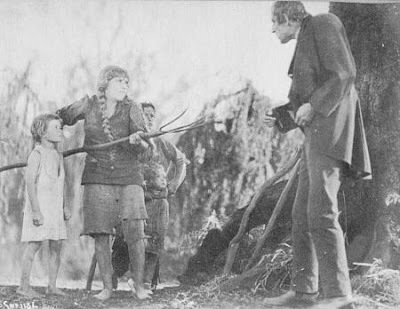 Unlike some of them, Sparrows does not rely on Pickford’s performance (or worse, mere presence) to justify its continued appeal. It is well-shot and well-paced by director William Beaudine, who evokes an Expressionist feel that recalls some classic German films that preceded Sparrows—Von Seyffertitz, in fact, looks a lot like a Nosferatu with hair. Most importantly, the film delivers its melodrama in spoonfuls, not by the truckload. It’s never ‘a bit much,’ even though it pulls one of the most outrageous cinematic stunts I’ve seen. Molly’s preoccupation throughout Act One is Amy, a babe-in-arms whom she alone seems willing to care for. Amy is too young to contribute to the work and too frail to persist amid the mess of Grimes’ farm. One night, while Molly is cradling her in their barn-loft quarters, Amy dies. Well, Molly falls asleep first, it seems; she’s visible in the bottom foreground of the frame, which is now dominated by the blank wooden wall of the barn. For a second we wonder why, then we see: the wall becomes a tableau, picturing Christ the Shepherd among His lambs. Christ then steps out of the tableau and takes the baby’s corpse from Molly’s arms. Perhaps this is a dream, but Molly doesn’t wake until the director has fixed his camera on Pickford, in close-up. She looks down to the child we can no longer see; is stricken a moment, then smiles with gratefulness. She knows the baby could not have survived, but whatever span of time she did persist would have been marked by suffering. Molly’s reaction to Amy’s death is important, because it reminds us of the fine line she treads between action and resignation. She’s been at the farm for years, most likely—long enough to be seen by the other children as a parental figure. But her time there has not made her passive. She’s servile to the Grimes’ because it’s the best way to ensure a steady supply of food; she doesn’t attempt escape because she considers it too dangerous. Maybe she could make it alone, but she won’t abandon the little ones to a man she may have seen hurl children into the swamp. Circumstances change with the arrival of a new infant—a happy, chubby little girl who happens to be the daughter of a wealthy man. This child has been kidnapped for ransom, and is being hidden at Grimes’ farm until the money’s paid. For the old man, it’s just another chance for cash, but for his wife (played with chilling understatement throughout by Charlotte Mineau), this baby spells doom. Now, she tells her husband, they have stolen from a man who does care, and does have the means to regain what he’s lost, and there will be no ground too impassable to save them from his approach. It is Mr. Grimes’ solution that finally spurs Molly to take the big risk; that is, an escape through the lethal swamp that’s been her excuse for staying all this time. Of course, she won’t go alone. This results in a third act composed almost purely of action—something worthy of Indiana Jones or better yet, Pitfall! I haven’t seen all of Mary Pickford’s films, but I’ve seen a lot. The number’s sufficiently great to form patterns in my mind—collections of types and situations common to her work. They don’t all make for compelling viewing today, and that’s part of why my favourite of her films has always been My Best Girl (1927), a romantic comedy lacking most of a Pickford film’s trademark trappings, and thereby freeing the star to simply act, which she could, of course, do brilliantly. But I can’t say My Best Girl is better than Sparrows—a far more challenging film in terms of theme and design. This seems fair, since it is Sparrows, not My Best Girl, that represents Mary Pickford at her best. That is, the perfect balance of stillness and action, slapstick and schmaltz; with no one facet overpowering the rest. Rent it soon. I enjoyed a live screening (with piano accompaniment) at Toronto’s restored Elgin Theatre, an excellent venue for silent film. Sparrows is also available on DVD through Image Entertainment. The disc includes two of Pickford’s early shorts, Wilful Peggy (1910) and The Mender of Nets (1912), both directed by D.W. Griffith.